Which Social Media Channels are Used Most By Meeting Planners? Of all of those surveyed, 92% of all association planners said that promoting their events was the most important step to take to have a successful event or meeting. Virtually all agreed that the best way to promote events was through the use of social media. However, that does not mean all social media outlets are created equally when it comes to event promotion. Which Social Media Channels Are Best for Event Promotion? It’s no secret that some social media channels are better for promoting events than others. So, the question is: What are the social media channels that are most popular for marketing meeting events? The top social media channel that meeting planners are using in 2018 are Facebook and Twitter. Why are companies using these sites? For Facebook, the base of users is still one of the largest in the world, making it a great way to get the word about an event out. Word can also spread rapidly when people mark “Going” on a Facebook event page. Their friends see the event or they can share the event to get others to come, too. Meeting planners also rave about being able to “invite” people to the meeting so that they see it’s happening. When people RSVP it allows the meeting planner to plan for how many people will be at the event before it even happens. For Twitter, the option of “retweets” is a powerful way to spread the word about an upcoming meeting or event. Twitter also allows the user to add links which helps the meeting planner link to other web pages where more information about the specific event being talked about is able to be found. Which Social Media Channels Are Not As Popular for Event Promotions? While Facebook and Twitter are clearly the most popular social media channels used for advertising meeting events, the next question poses: Which social media channels are not as popular among meeting planners? According to the Successful Meetings Magazine poll, the least popular social media channels for meeting planners are SnapChat and Pinterest. Snapchat is more of a personal form of social media which is used to reach out to friends and family. Many people share personal information on these channels. It is often not considered professional enough to be used by corporate or association planners when planning meetings. Moreover, it doesn’t offer a way to connect additional information about the event to the invitation. There is also no great way to respond or RSVP to events that are being advertised. Pinterest is more geared towards “ideas” rather than creating events. For example, if someone is hosting a holiday party, Pinterest is a site they might use to curate ideas for decorations or food, but not so much to invite people to their party. For this reason, many corporate and associate planners tend not to use this as a method of communicating events to possible attendees. 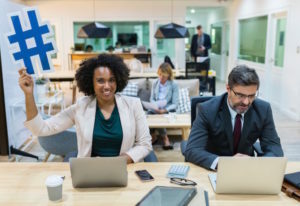 Social media use among corporate planners is continually evolving, yet some forms of social media are more useful to meeting planners than others. Most social media channels that are used by meeting planners are those that allow them to share additional information and link webpages about the event to the announcement. Meeting planners also look for ways to allow potential attendees to share the event and RSVP easily, which is why Twitter and Facebook are the most popular social media outlets for meeting planners. If you are a meeting planner looking to plan and then share your upcoming meeting on social media please feel free to contact us here at AMA Executive Conference Centers with any questions you may have. With Centers in Atlanta, New York, San Francisco and Washington DC we’re here to get you going in the right direction!